Budding carpenters can learn about different jobs and how tools can be used to make things while being eco friendly! - To be used under adult supervision. - Not suitable for children under 36 months. EverEarth takes its responsibility for the environment and society and is committed to sustainable and indulgent behaviour towards resources. The company pays special attention to its carbon footprint and respect for the environment while demonstrating the utmost vigilance in terms of quality and safety using renewable materials and water-based paints, natural colours, prints with soy ink, recycled cardboard packaging. Its facilities are ICTI-certified. 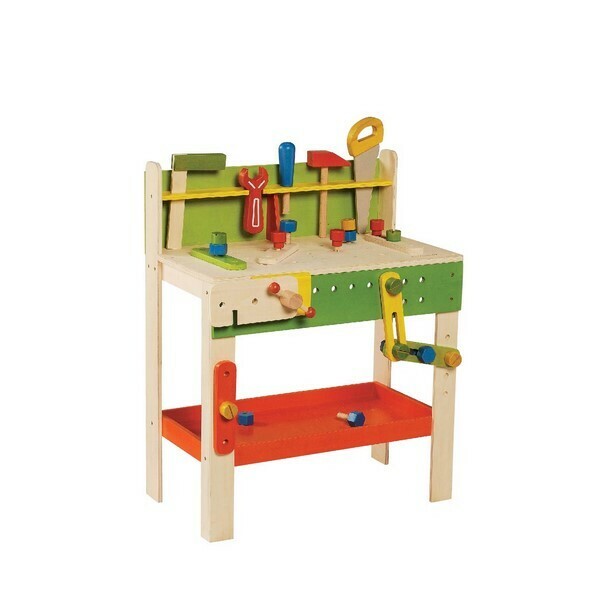 All wood used in the manufacturing of EverEarth toys is FSC certified. - ISO 14064 is an international standard for environmental management, which means that EverEarth can keep track of its impact on the environment and work to reduce it. Offices and factories have been ISO 14064 certified. - The company minimizes how its operations affect the environment. ISO 14001 certifies that we live in a sustainable environment, because we limit our impact on air, water and earth. - OCHAS 18001 demonstrates that EverEarth cares about the health of its employees and their safety.